Wakefield’s Award Winning Long Division Festival is back! 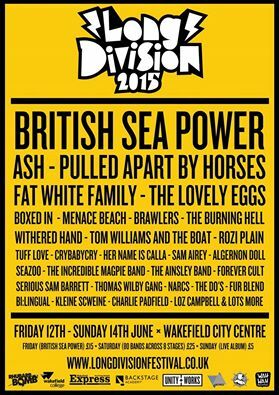 Long Division 2018 will take place on June 1st to 3rd in Wakefield City Centre across multiple venues. After a break in 2017 the festival will return with its largest and most diverse lineup yet. The first tickets for Saturday June 2nd have been released. Information on the Saturday can be found here. More info on our artists and venues are also available, with many more of both to be announced. However, to keep up with the latest information, sign up for our mailing list or follow us on social media (we like to give cryptic clues as to what we are planning). Now in it’s 5th year, Wakefields Long Division Festival has grown from strength to strength. In its short history the festival has grown in stature and played a significant part in getting the city’s old music venue, Unity Hall re-opened last year. In its heyday Wakefield and especially Unity Hall played host to some of the biggest names around – The Damned, The Specials, Iron Maiden, The Ramones, Eurythmics to name a few – So it’s great to see that thanks to Long Division, Wakefield is well and truly set once again to be put back at the top for live music in the North. “It’s hard to believe it’s five years since I started Long Division. Wakefield has come a long way in that time. The thing that excites me most about Long Division is that it still excites me. It’s still so much fun to organise, and to see and hear such amazing bands in my hometown. And then to meet people from all over the country who have travelled here and are having such a great time. I’ve just got back from a trip meeting the big artist booking agents in London; they all know about Wakefield now, because of this festival. Returning this year to its familiar summer dates the weekend will take place from June 12th – 14th. Venues taking part this year include Unity Works Major and Minor Halls as the festival hub, with The Hop (Upstairs and downstairs), Wakefield Theatre Royal, The Orangery, Westgate Chapel and Players providing seven locations all within spitting distance of each other. With over 90 bands including loads of local talent and top names such as Ash, British Sea Power, Pulled Apart By Horses and The Fat White Family it looks set to be one of the best urban festivals of 2015. Saturday 13th June – One wristband, seven venues, 80 bands including Ash, Pulled Apart by Horses, Fat White Family and loads more to be announced. Sunday 14th June – Watch a live album by The Ainsley Band being made. A special event at Unity Works in association with Greenmount Studios (The Cribs, Pulled Apart by Horses).